Just wanted to say thank you for taking such care in packing and shipping my clock and pictures. They arrived in perfect condition. I just want to say how much I feel taken care of with my account with you. It is so nice to know that it's safe and confidential, and always on time. I'm grateful for your kind service. Thank you for the excellent packaging. I appreciate your good service! I just wanted to let you know that I finally got around to unpacking all those boxes. 100% intact. Thanks for taking such good care of my memories. Got this today. I was very impressed in the way it was shipped. I have never seen such a good job. Thanks. Just a note to tell you that I received the ice cream container last night - it arrived in perfect condition. What a great packing job - loved the way you protected the handles and surrounded the entire container with the 2" buffer away from the box. The box actually arrived with evidence of having been crushed slightly from the top, but the packaging kept there from being any damage. Many thanks! When asked if we could use these kind words on our testimonial page, the response was: Sure - no problem! I might also mention that Jesse coordinated a large shipment of items for our family to friends in Baton Rouge, LA. That went very well, also. You are doing a great job! A few weeks ago we got in touch with you in order to build a custom crate for a harpoon we needed to transport. I received confirmation today that the harpoon made it to its intended destination safe and sound and that it was very well protected so I just wanted to reach out and thank you for a job well done as well as for the excellent customer service we received every step of the way. We will definitely be keeping you in mind for anything similar in the future. Chris and Jim are helpful, kind and incredibly patient. My other half and I sold a golf cart on ebay and then the shipping confusion began. Ebay told us one thing, UPS told us another and Pak Mail told us something else altogether. By the time everything was sorted, we found that Pak Mail was the only place that really seemed to know what they were doing! They gave us a very fair price for freight which turned out to be the only safe way to send the cart and it actually cost LESS than UPS ground even though it would be providing much better handling. These guys really know their shipping. From now on, anything we sell we are taking to them, putting it in their hands and sitting back knowing they are honest and knowledgeable and will take care of it all without our having to worry. Our experiences with USPS were a nightmare. Our experiences with UPS was like getting caught in a whirlwind of confusing information, and our experiences with Fed X though better than UPS were not great when it came to trying to figure out insurance (hard to get straight answers). Really, the bottom line is if you don't want to worry, take your package to these folks. I needed to have two pieces of antique furniture moved from my parents' home in Colorado Springs to my home in Lubbock. Pak Mail was recommended to me. They answered my questions patiently on the phone. Two polite gentlemen showed up at the appointed time and carefully moved the furniture. The furniture arrived at my home very well packed. Both items arrived without damage. Thanks Pak Mail! I'm so excited about my new end tables. They are even more beautiful than I expected. Kiki was a pleasure to work with and the shipping/packaging was amazing! I've never seen anything packed as securely as my new tables. I'm totally impressed! Thank you Kiki for a wonderful experience! Thank you so VERY much for your exceptional customer service!! Your store enabled me to acquire and ship a large and fragile item from CO to AZ [carousel horse from Goodwill Auctions] without any problems whatsoever. Having never done this before, you assisted me each step of the way to ensure everything went smoothly. Your reasonable shipping prices, friendly and helpful staff, prompt responses & courtesy follow-ups represent everything a business should be. I can HIGHLY RECOMMEND YOU to anyone who needs this same service. I could not have asked for a better staff to get this job done! Again thank you so much for your patience and help, not to mention getting my item delivered quickly and in perfect condition!! Thanks Jim, this [wind turbine shipped] will really help me when I get home, power cost a bunch on Guam, gas is $3.55 a gal. I just wanted to say thank you. You did a great job at packing up my print [from Goodwill Auctions] and it was delivered in A+ condition. I was very impressed with the promptness in getting it packaged and delivered. I just wanted to let you know. I was very pleased with your service. Thank you for the beautiful packing job you did! The picture came through in perfect condition. I couldn't be happier! I shipped an antique ice box (furniture) to Dallas, TX, and Pak Mail, Centennial Blvd, shipped it for me. It was very brittle and had a cracked leg in a clamp. I'm so pleased that my brother received this family treasure in mint condition. Jesse, at Pak Mail, did such a great job... I never thought about it arriving in anything but great condition! Amazing! Many thanks for letting me know Jesse and doing the collection and delivery. Great job of packing my 14 pocket watches guys - thanks! Hello, wanted to advise that clubs arrived Wed. Thanks for the timely and well-protected shipment. Will certainly contact you again should I again want to bid on clubs from the Goodwill. Just wanted to let you know that the clock [cuckoo clock from ShopGoodwill] arrived today safe and sound. I want to thank you guys for the EXCELLENT!! job of packing, I see why you are in this business. This was the most professional job of packing I have ever seen. I just want to thank you so very much. THANK YOU again for "taking charge" of my purchase [at ShopGoodwill]. Picking it up at no charge was so generous and your shipping fee was very reasonable. I was astounded that the painting was delivered to my home today - that is two days from the initial email to it's arrival in Houston! The details of packing and care given in the shipping of my painting were so professional and your work and you are "first class." I hope all your customers appreciate you and your fine work as much as I do. Thank you for your kind and helpful assistance with our task to transport furniture and household goods to California during the summer of 2012. Your patience, understanding and many helpful suggestions, in addition to the friendly handling of the actual loading and pickup, were most appreciated by my sisters and myself. All estimates and arrangements were professionally handled and the items were delivered safely within the estimated delivery time. I would be pleased to be a reference for you at any future time. Thank you so much for the incredible service!! The package arrived when you said it would and it was in perfect condition! You were a pleasure to do business with. You made this so easy. I know why my dad has always taken his business to you. Again, thank you so much for your kindness, efficiency, personal care, reliability, and how trustworthy you are! Today I needed notary services. I have used your store for shipping in the past so I thought I'd see if you provided that service. I went to your web page to see if you did. I was so pleased and surprised to find all the information I needed on your web page. I selected the notary section and up pops all the information I needed. Everything was clearly written and easy to understand. I found the information quickly and was able to go to your store with confidence of knowing what was needed and how much it would cost. So many web pages have lots of words and pictures and yet they provide very little information. I was impressed with your home page as it is "clean" and professional without being over whelming. I did not have to click on several tabs to find the information I was seeking. It was so easy to navigate. I wish more people would follow your lead in making their web page simple and easy to use while providing lots of information clearly. Thank you for making your web page easy for people like me who are not comfortable searching through pages and pages to find the correct information. 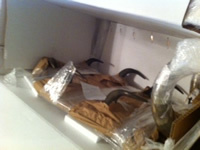 Just wanted to thank you and your team again for an amazing job packing our red velvet horns, as they are an exceptionally difficult, heavy and awkward piece to ship. Both my husband and I were extremely impressed when they arrived in perfect condition. We could both see they had been packed with a great deal of care, attention, and thought. Being an antique, one of a kind item, they are irreplaceable, and we are very grateful and happy that you took the time and the effort to make sure they arrived safely. It was well worth every penny! We both would absolutely endorse you as the premier packers of the world! 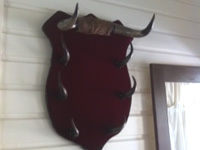 If you can pack and ship a large red velvet horn rack for a trip through three states, you can sure surely pack and ship anything, anywhere! 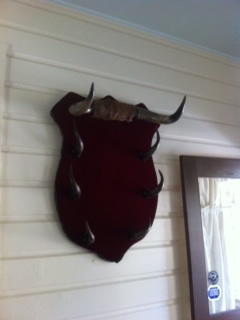 Will send you a photo of the packing, as well as them being on the wall. Our sincerest thanks for an awesome job! This is a note of thanks for the phone assistance offered on Jan. 21 by Jim. I had called to find out if I could get a car key delivered overnight to Idaho. Jim did some checking and the cost was prohibitive, but he also made a couple suggestions about trying to get a key made. It’s a long story, but his tips led me to figure out how to get a key made so my daughter, stranded at a remote ski area in northern Idaho, could get back to her apartment. We saved time and money â€“ and I learned quite a bit about car keys! Please pass my thanks to Jim. And the next time I need shipping services â€“ I know where to go. Thanks so very much for your help in keeping my shipping costs to a minimum. As small businessmen yourselves, you know only too well that every dollar these days is important. Your customer service is top of the line and every shipment thru PakMail and R&L Carriers has been on time with no problems. Please be assured that you are my shipper of choice for The ACE Pitching Machine and I will be sharing my very positive experience with others. I just wanted to thank you for the super job you did in wrapping some precious items for me to send to family in the Atlanta, Georgia, area. We always have to put a value on items we ship but the items were made by my late mother-in-law when she was a resident in a senior retirement home several years ago. We would be unable to replace these ceramic angels because they had been made by mom. Thank you for your care and calming my fears about sending these irreplaceable items. Not a single thing was broken!! Thanks so much for the info. I have a few questions so let me know your schedule and I’ll give you a call so we can go over them. I’m sorry we didn’t get to meet as well. You are very perceptive; Mom’s favorite color was red. I try to recall the good memories during these difficult days and have been told that as time goes on that will become easier and easier. For now I continue to pray that the Lord comforts me through each day; knowing she is with him and no longer suffering helps as well. I hope Jim told you how much I appreciated your continued patience and sensitivity to my circumstances. You have been truly a blessing. Thank you so much for all your help with the shipping of a motorcycle engine! The pricing was great and delivery was right on time. The buyer was thrilled with how safely the engine was secured and transported. I won't hesitate to use your services again and I recommend PAKMAIL to my family, friends and customers that need professional shipping services. Thanks for your help with my sister's stuff. We appreciate how well you cared for it. Thank you for the extraordinary help you gave me with shipping my daughter's rug to California. All of the time you take making phone calls to UPS paid off -- the rug arrived yesterday in fine condition. Thanks again for your superior customer service and willingness to go the extra mile. I just wanted you to know how pleased I am with the packing and shipping service you recently provided for me. However, it was the unexpected answer that I received from the person that repaired my laptop that I wanted you to know about. When I received my laptop back I phoned to thank the technician for the quality work that was done. I asked if that is how he sends out all of the finished repair work because I was very impressed with the care and protection that was taken to ensure a safe return. His response was, "That is how it arrived to me and it is clearly the best packaging I have ever had sent to me." Needless to say I was unwittingly surprised that he had used the same packaging to return my laptop. I wish I could have taken credit for a job well done; but, the credit clearly is owed to you. Thanks for taking great care of my important package and I'll be sure to recommend you in the future to anyone looking for personalized, professional service that exceeded all expectations. Thank you for your extreme generosity and continued friendships. Your success is a tribute to all of the hard work and continued improvements I have witnessed all year. I am very impressed and happy for your success!! I wish you all a happy, healthy and prosperous New Year!! Just wanted to let you know that the rock and dirt samples that you packed up and sent to Virginia late last week arrived yesterday afternoon -- a day ahead of the time you estimated. Things were well packed and it all looks fine. Thank you so much for all your help in moving my son’s belongings back to Minneapolis. All packages appeared to have arrived safely and quickly. I especially appreciated Jim picking up the boxes at the college. That saved me sooooo many trips!